Hello everybody. There is not much going on this week, unless you count the crazy goings on of "Joseph and the Amazing Technicolour Dreamcoat". My daughter the Pickle is performing in the junior choir. They are the little cuties who gather around Joseph and sing "a-a-ahhh!" ever so sweetly. It makes me so proud to see her performing. One hundred children from our school are in the cast, as well as one of our amazing teachers playing the part of Pharoah. I thought I would share some photos of some lovely local gardens that I have admired over recent years. I am sorry if I can't quite remember their names...I should write these things down. Anyway, in my garden it is time to plant the bulbs and sweetpeas for spring, but I haven't done that yet. It is time to "lift the skirts" of the silver birches along the drive, by pruning their lower branches. But I haven't done that yet either. There are two liquidamber trees about a foot tall standing at my front door, waiting to be planted and turning a lovely shade of red. My handbag is still full of chestnuts, and there are gazillions of acorns rattling around in the car. Maybe one day I will catch up with all these gardening jobs, not to mention the weeds that seem to like the rain so much. 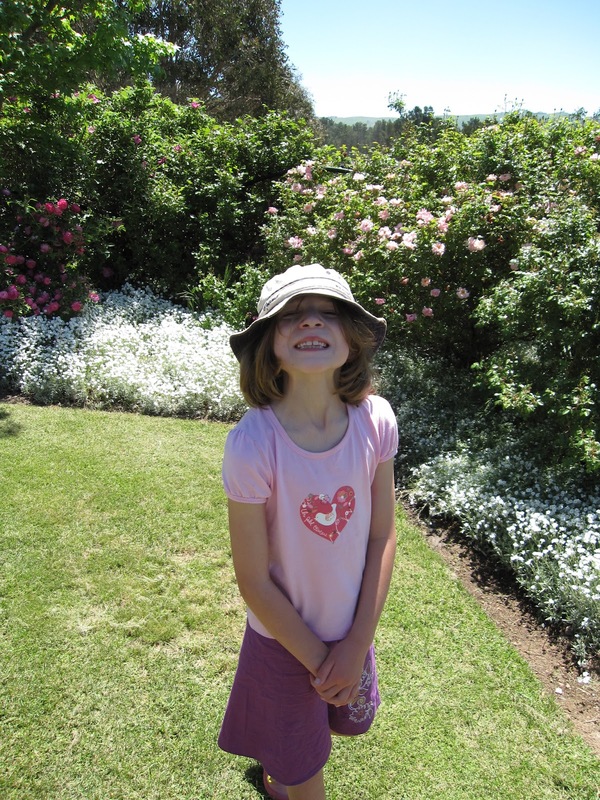 In the mean time, please enjoy some photos of other peoples' gardens. This is a garden in Burra. A lovely combination of natives and exotic trees. I don't like that variegated thing at the front though. This is the same garden, look at those lovely views. Here's my husband admiring the view. 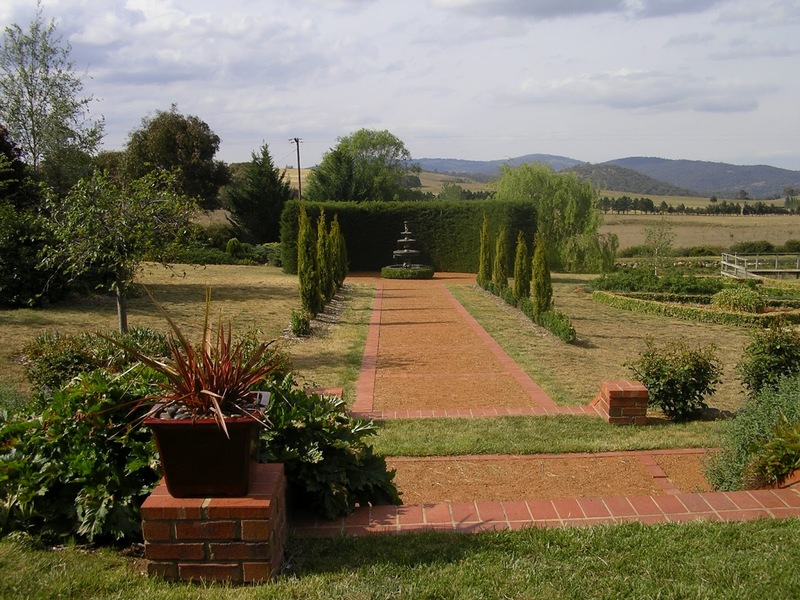 Here is another garden, this time near Yass, with lovely views. This reminds me of Narnia! Here is their sweeping drive. 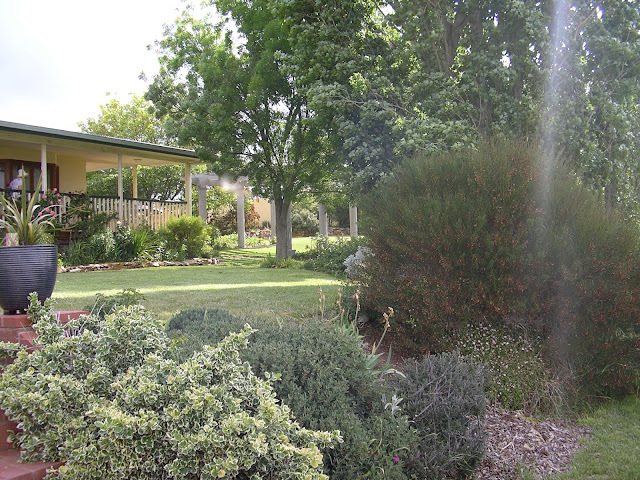 A house near Yass. I love these golden elms, and I plan to plant one soon. A horseshoe pear. 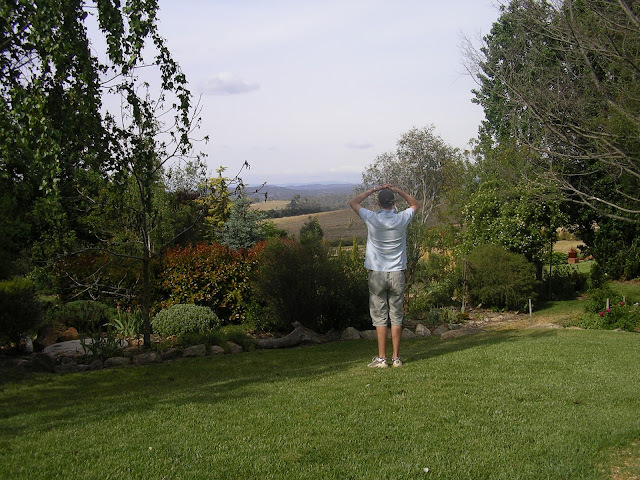 Last week hubby me the sculptor while he was waiting for me to explore the opshops of Bombala. We liked the look of this swimming pool. One day in the future we would like a pool out the front of our house, but I prefer the more natural, curvy shaped pools. 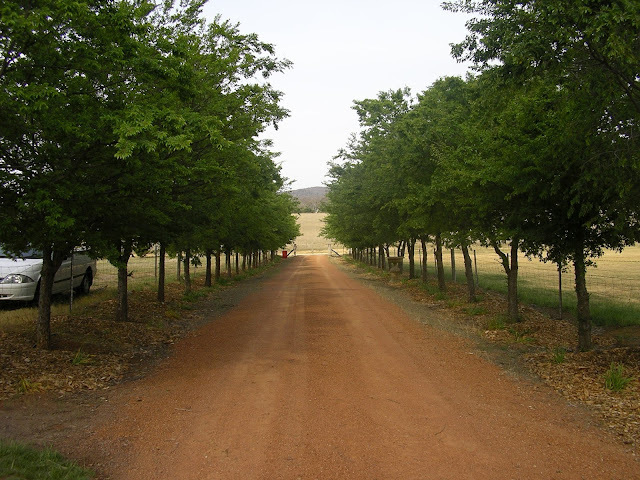 This garden at Burra has a drive lined with chinese elms: Ulnus chimensis. We have these planted along the front of our property. In shop news, I have reached 300 likes on my facebook page. www.facebook.com/bananaorangeapple1. Head on over and like me too if you haven't yet. There is a special deal going on there to celebrate 300 likers! I received a request to make a rainbow dress in size 4, and of course I was delighted to get to work. I had to hunt through several thrift stores for bright coloured linens and make a trip out to Spotlight at Queanbeyan. The poor cutting lady had to cut 20cm each of 19 different fabrics! The bottom purple row stretched for 5.5 metres (that's 18 feet) before I gathered it up, sewed it into a circle and attached it to the skirt. If you'd like to make your own, check out the pattern at the indietutes blog. If you want me to make you one, send me a message and we'll do a deal! Here it is with its tamer, pastel sister. I cannot imagine a little girl who would not be thrilled to pieces to have a dress like - which she could twirl around in and pretend to be the world's grandest ballerina !!!! Beautiful gardens! I felt like I was right there with you. And I could hear the acorns rattling around in the car. What is a liquidamber tree? The rainbow dresses are darling!! Gorgeous photos, and I really love those dresses! Thank you for sharing! Lovley garden photos! So inspiring...as I watch the rain here in Oregon! Love the dresses, too. Thanks for stopping by my blog! Don't forget to enter my Facebook drawing! So there were too many roses and you didn't like that varigated bush in the first picture. LOL. There are not enough roses around here and I have one of those varigated bushes in front of my deck and I love it. How cute are those dresses! And so much work! So nice for you and hubby and daughter to go on a garden tour together! Such wonderful pics! I love the rainbow dress!! Luella, a liquidamber is also called a sweetgum. They grow well here since their leaves turn in warmer temps than the other deciduous tree. They are pretty much the best/only autumn coloured tree for Sydney and other subtropical parts of Aus.